The HHTQ88 is a precision test instrument for automotive, automation, laboratories, and general industrial applications. The unit comes complete with the torque sensor with built-in 12 mm (0.5") chuck and chuck key. 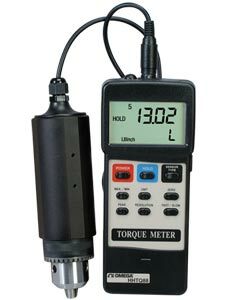 Three selectable torque units (kgf-cm, lb-in, N-cm) give this instrument almost universal compatibility with all measuring systems. The HHTQ88 also has fast and slow sampling rates to fit most automation applications. The readings are easy to read, displayed in large 15 mm (0.6") high digits. The RS232 serial interface allows you to download data for use in your data logging or recording programs. 注: Comes complete with battery, meter, torque sensor, chuck key, hard carrying case and operator’s manual.